1) Edgintons lively use of the English language, and the idiosyncrasies of Victorian language in particular (seen in full florid effect in his magnificent Stickleback for 2000AD). 2) The plot! Steampunk revenant shenanigans with Holmes & Watson – and in this issue, the return of a familiar foe……(but not how you may have remembered him). 3) Said plot is lively, witty, on occasion quite chilling. What more do you need from a Sherlock Holmes story? 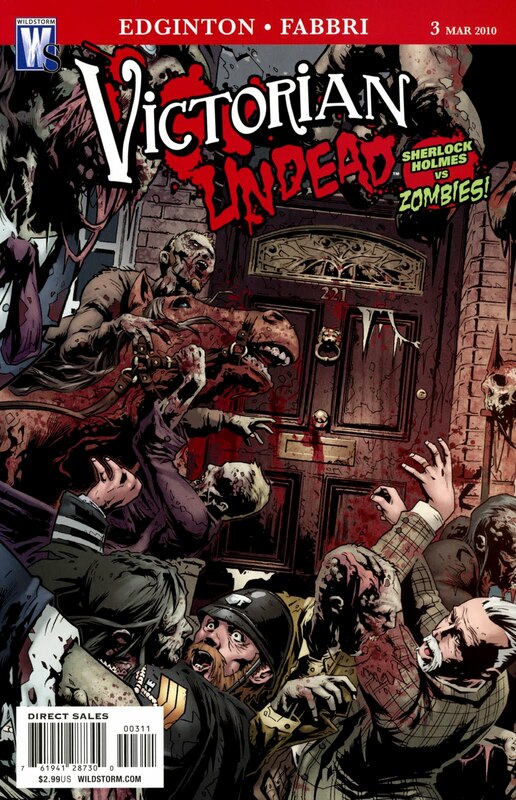 4) Art (from Fabbri) is bright, with some nice Steampunk touches, and his rendering of the undead is solid. There is light and shade, squalor and sleaze, grotesquery and ghoulishness. He can summon a mood of Victoriana with his bold, clean lines – plus, the guy draws mean sideburns as well – respect. 5) It’s accessible. You do not need to be mired in the mythology of Conan Doyle’s creation to appreciate this for what it is – rip-snorting adventure!